The 2017 wildfire season in BC was the worst on record, both in terms of the total area burned and the costs associated with fire management and suppression. Many have argued that we should expect to see more forest fire seasons like this past one, due to rising global temperatures, while others argued that there was no proven link between climate change and BC’s forest fires. The forest fires in BC illustrate the fact that climate change has very real economic consequences. The BC government spends hundreds of millions of dollars each year fighting wildfires. These costs topped $500 million in the record-breaking season of 2017 and averaged almost $200 million per year from 2006-2016. And these figures only include the costs associated with suppressing and putting out wildfires – they do not include the damage caused by the fires. The two most significant wildfires in BC this summer caused over $127 million in insured damage alone. So it’s important to know – for planning purposes – whether or not climate change means that we’re going to see more forest fire seasons like the last one. What does the science say? It is well established that climate factors have an impact on forest fires. 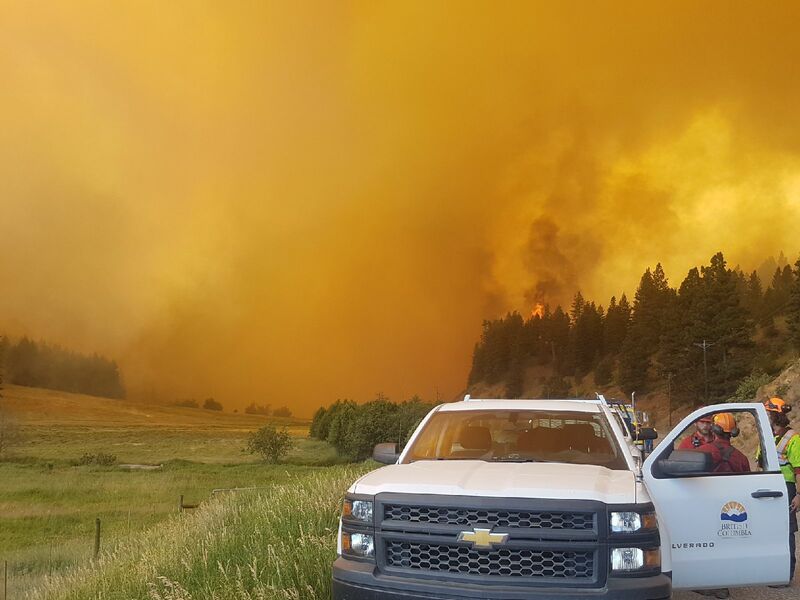 As conditions get warmer and drier, fires become more common and more likely to spread. And as climate change creates warmer conditions, many parts of the world will likely experience increasingly common and severe wildfire events. In Canada, fire-prone conditions are predicted to increase, and boreal forests are likely to be especially affected. And, indeed, research has shown that fire management costs in Canada have increased in recent years, and extreme fire events are becoming more common. This problem is not unique to Canada; many other regions of the world are experiencing increasingly dangerous and costly wildfire seasons. While climate change can not be blamed for 100% of increased forest fire costs, climate change has increased fire risk in BC and will continue to do so in the future. Various researchers have conducted studies to quantify the impacts of climate change on forest fires, and the associated costs. These studies often use climate models to project the future area burned by wildfires. For example, a Canadian study has projected that fire suppression costs in the country will increase by 60-119% by the end of the century due to climate change. Annual fire suppression costs in Canada averaged $537 million from 1970-2009, but this study projected that figure would increase to between $1 billion and $1.4 billion by the end of the century. Additionally, fire seasons that we currently consider to be extreme in BC (i.e. occur once every 10 years) could eventually become the new norm; as many as two out of every three fire seasons could be “extreme” by the end of the century. Studies like this one show how climate change will impact our forests in the future, and make it clear that the costs of fire management are going to increase. They also provide insight into the economic benefits of reducing global greenhouse gas emissions. While climate change is going to continue in the near future, we can reduce the impact of this future change by getting our fossil fuel pollution under control. Taking action to reduce emissions now will have impacts on fire patterns in the coming century, and can mitigate the increased suppression costs that we will have to pay in the future. Climate change can also have indirect impacts that lead to worse fire conditions. In BC, warmer temperatures have increased the range of the mountain pine beetle in recent years. Outbreaks of this pest kill trees and create ideal conditions for fire, as damaged or dead wood acts as fuel that can allow fires to spread. Colder temperatures limit the range and size of mountain pine beetle populations, while warmer temperatures allow the insect to expand its range north to previously unaffected areas. In addition to contributing to increased wildfire risk, pine beetle outbreaks can have significant economic effects in their own right. One study has estimated that the mountain pine beetle will cause a cumulative present value loss in BC of over $57 billion in GDP from 2009-2054. As the research referred to above confirms, both past trends and future projections suggest that our future will include more forest fires. However, this does not decisively answer the question of whether the 2017 forest fire season was caused by climate change. But science is getting better at linking particular weather events to climate change. The World Weather Attribution (WWA) project, for example, looks at how the probability of specific extreme weather events has changed as a result of climate change. The project assesses specific weather events such as heat waves, cold waves, heavy rainfall and floods, droughts, heavy snowfall, and storm surges to see how climate change has contributed to a particular extreme weather event. A major forest fire in Spain forced more than 1,500 people from homes, campsites, and hotels, and encroached on a UNESCO World Heritage site housing endangered species. In Portugal, a deadly forest fire killed at least 64 people, injured 204, and displaced over 500 from their homes. Triggering the EU’s Civil Protection Mechanism, France, Italy and Spain have provided firefighting planes to help get Portugal’s “worst forest fire in more than a century” under control. The smoke of the wildfires in Portugal were catapulted high into the atmosphere and then transported several thousands of kilometers across Europe. Smoke from the fires could be seen all the way to the Swiss Alps from the station at Jungfraujoch (3580 m). The study also found that the intense summer heat of 2017 would become the new normal in the region by the middle of the century. However, saying that climate change increases the probability of a heat wave is not the same as saying that the forest fires were 10 times more likely to occur as a result of climate change. It merely means that the heat wave conditions that exacerbated the fires were more likely. Forest fires are made worse by heat waves, drought and pests, but also by careless behaviour, poor forest management and many other factors. So far as we can tell, there has not been similar research done in BC. Increasingly climate change attribution research focuses not on whether a weather event was caused by climate change, and instead on determining how much climate change contributed and how much it will contribute to changes in the future. However, claims that fires are not influenced by climate change and environmental factors are ignoring well-established scientific evidence. All of this research highlights that the economic consequences of climate charge are going to be significant, and that mitigation efforts are needed now to avoid the most serious potential consequences. The 2017 wildfires that cost BC hundreds of millions of dollars may foreshadow what is to come over the next century. Projections indicate that fire seasons similar to 2017 will become more common in the future. This will have huge ramifications that go beyond increased suppression costs. Economic effects may be felt in various sectors, including forestry, tourism and recreation. Wildfires also cause substantial damage to property (and in some cases, human life) – this damage has huge economic and social impacts. Gaining a better understanding of forest fires and climate change can help us address future extreme events. Fortunately, taking steps to mitigate climate impacts now can help us better prepare for the years ahead. Top photo: Government of BC via Flickr.